Need more information about booking Home 6998765 ? This private apartment is located at Riviera Foothills, Arpora. It offers comfortable accommodation, with all modern facilities. 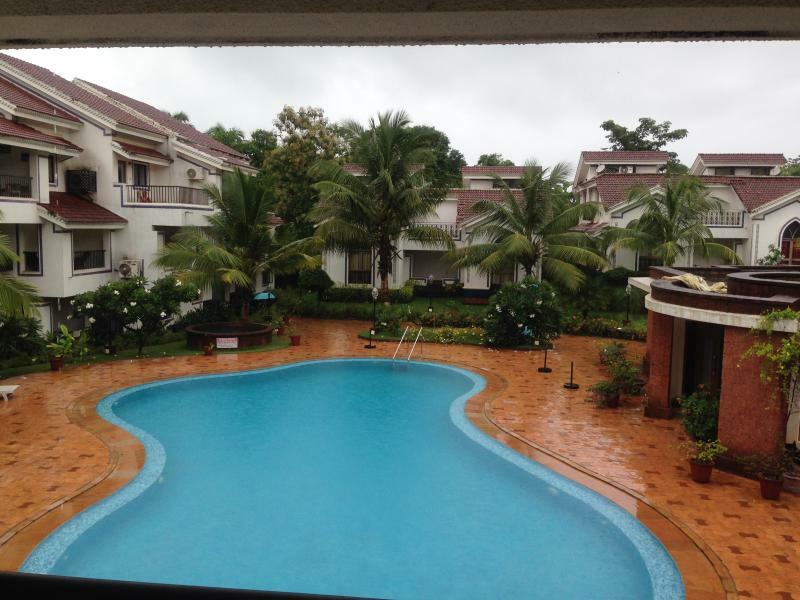 Well appointed self service, airy, fresh, air-conditioned one bedroom spacious apartment on the 1st floor of gated complex with 24 hour security and gym in Arpora, North Goa. Exclusive for long stays. Located within 2 km from the famous beaches of Anjuna, Baga and Calangute, this apartment at Riviera Foothills features an outdoor swimming pool and gymnasium. It offers comfortable rooms with furnished kitchenette, and cooking facilities. Free parking is available. The air-conditioned rooms are spacious. The bedroom has a large double bed, wardrobe and a dresser/mirror. There is Tata Sky Digital service provider , 46 in Sony TV, Fridge , Washing Machine, Bose sound system and a pool facing balcony off this room with stunning views over the foothills of Arpora, the pool and the gym. A large terrace and fitness center is available. Dining options include two restaurants Lobster / Chandan Restaurant that are located next to the property. There are other restaurants within 5 minutes walk of this property. The site is situated next to the beautiful (and soundproofed) Club Cabana ideal for party goers. However don't let that fool you, the site is tranquil and serene, a lovely relaxed place, an ideal getaway for families or couples. The property is modern, and has a pool facing balcony. Riviera Foothills also has a lift to assist visitors. The property is 10 km from Mapusa Bus Station, 20 km from Thivim Railway Station and 45 km from Goa International Airport. There is a lift to all floors for easy access. We kindly request you to take care of all the belongings in the apartment. Please treat this house as your own house. You can get in touch with Keith (the owner) through the contact form on this page. Send Keith (the owner) an email through the contact form on this page. Alternatively, if there’s a phone number on this page, you can call them. How do I contact Keith (the owner)? If you’ve already booked, go to Manage your holiday booking to view Keith the owner's contact details or send them a message. Or send Keith (the owner) an enquiry through the Contact the owner/manager form if you’d like a quote or more info first. When you pay online through the Book your stay form, a booking request is sent to Keith (the owner). You’ll find out within 24 hours whether they’ve accepted - no money will leave your account before then. You can also request a quote from Keith (the owner) through the contact form. The owner will email you the total cost for your dates and a link to book and pay online. Use the Book your stay form to pay provisionally online. You can pay by credit/debit card or PayPal. Keith (the owner) will have 24 hours to accept the booking and no money will leave your account before then. Why can't I call Keith (the owner) before booking? You’ll need to contact Keith (the owner) to do this. Send them a message in Manage your holiday booking or through the contact form on this page. You can request to change the dates or number of people on your booking via the Manage your holiday booking page. To change your holiday dates use the Edit booking button. If you need to change the number of guests staying then send Keith (the owner) a message. If Keith (the owner) agrees, they’ll send you a revised quote outlining the changes. You can review and accept/decline this from the Manage your holiday booking page. You’ll have 48 hours to take action before the revised quote expires.